I kept thinking about my last project that failed. I am always excited about presenting project that are really great, but a failure is giving me some uncomfortable feelings. I did retry the design but got the same results, failure of the stitching. I should have been suspicious when I saw that the pattern had a LOT of jump stitches. 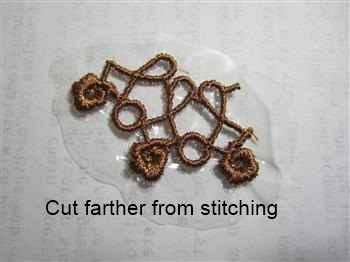 An experienced digitizer can and does make as few jump stitches as possible. In fact, I know a digitizer who prides herself on never using jump stitches! I discussed this with an embroidery friend and got the answers (yes, plural) immediately. The digitizing was definitely a problem. KISS is the answer (as it usually is). 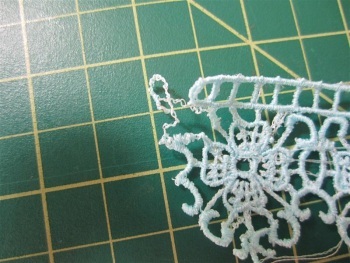 I am not aware of anyway to judge a digitizing except to sew the design out. I do take advantage of the freebies offered by different sites, not because they are free, but because they are a sample of what you can expect in the way of quality. Free is the right price if the quality is not there. So, I decided to try the method again. I started with a design that is definitely quality. I know the digitizers work and I want to have something that is unique for my bridal boutique on Etsy. The instructions were simple to follow and again, I am creating a sample before I try to do something larger. Here is the digitizer's completed project. I know that sometimes you get an artists rendering (run away from those!!) of a completed project, but when I see a truly completed project, I know that the digitizer has worked out all of the issues. When I did the blog on 'endless hooping', I used a method that is easy for me to use and I have done so successfully many times. This digitizer created the design with a 'built-in' method of creating an endless line of embroidery. You could use it on a napkin and/or the entire table cloth! 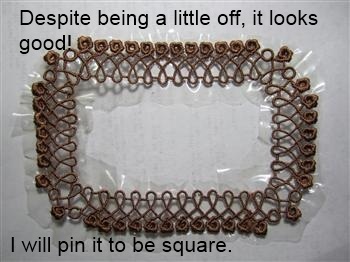 This set is created so you chain together the lace portions to create a border of any length. Each design section shows 2 colors so that your machine will stop to set up the actual chain. 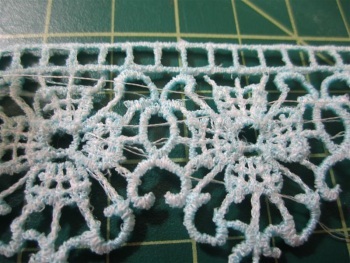 You will use the same color as your lace for both. 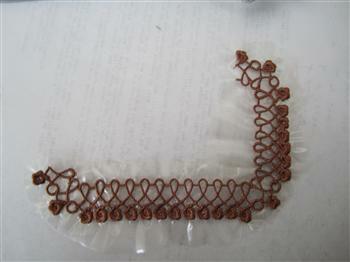 For these instructions, there are sections marked with an 'a' to create a chain and some with a 'b' to end the pattern. I began with a corner, using the 'a' style. 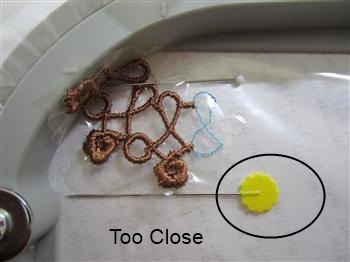 The directions indicate that you need to trim the sew out with a half inch to an inch of stabilizer left on the design. 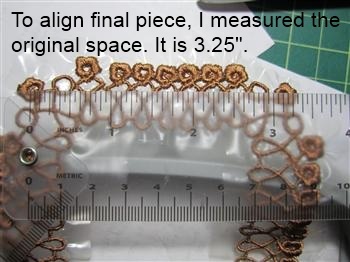 I recommend leaving the 1" because you will be pinning it to the next piece and you want to have sufficient room for your straight pins to avoid the machine's needle. I am using Badgemaster, so I can cut from the film without loosing the strength. I know if I were using other water soluble stabilizers, I could and would not do that. Here is the layout for matching up the design. The blue is for the sample. My straight pin was too close to the eventual stitching. After completing a corner, long side and corner, I used a short side so that it will be a rectangle rather than a square. As I went along, I was getting giggly because it was WORKING! Here is the finished square, made mostly from a single Badgemaster sheet. After doing the first 'chain' the only thing left to do is keep doing that chain, but I would say this is not a project for a Newbie. Getting the area lined up was not always easy. I even removed one corner because it was not well aligned. 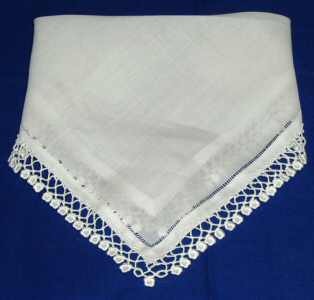 However, I can see this on a pillow case, placemat, a hem on a little girl's dress, anywhere you can have a straight edge with or without a corner. Here is the finished project. When I zigzag it to the cloth, I will make it square. Success is a 'high' for me I never need anything else to have a great day!! !